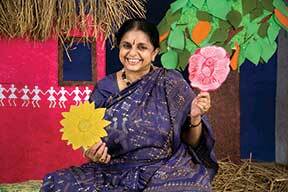 Geeta Ramanujam has established storytelling as an effective educational and communicative tool. In her opinion telling stories addresses the fundamental aspects of communication – listening and speaking, and when these two are taken care of, reading and writing fall into place on their own. The idea of using storytelling in the classroom came to her from her own teaching experience. Why do you think stories are an important aspect of learning? There are many reasons. Storytelling as an educational tool promotes an interactive and interesting teaching-learning ambience. Stories help improve children’s attention span and promote better involvement and participation. They generate better interest and conceptual understanding of the topics of study. Storytelling also facilitates creativity in the teacher, breaking the monotony of daily classroom teaching. It kindles creative imagination in the children. A walk down the annals of history will tell you that the finest educators resorted to storytelling to teach concepts. The famous Panchatantra is nothing but a collection of stories meant to give wholesome education. How exactly do you narrate stories? What tools do you use to add that element of ‘interest’ in your storytelling session? Having attended a number of storytelling festivals abroad, what are the differences that you see between contemporary Indian storytellers and others? In India, storytelling as a performance art has been there for centuries. So we have numerous accessories to go with it – puppets, chitrakathas, kavads, musical instruments, and so on. Whereas, I notice that international storytellers primarily rely on themselves to narrate the stories. Some people use musical instruments to supplement their storytelling, but nothing else is involved. It is recognized as a unique art form, mainly for adults. They have separate puppet shows and usually do not mix it with storytelling. They do think that integrating storytelling into education is a novel concept and more people are trying to embrace this idea. What are the frustrations and challenges of working in this field? People still do not value this art form and are unable to recognize the depth of this field and its relevance and significance to learning. Even today, storytelling is considered a frivolous art form and not a serious subject like math or science. Nobody realizes that it is in fact a value addition to learning. The big challenge that we face in popularizing storytelling in education is the lack of support from the government and other educational bodies either financially or morally. So what can you teach through stories? Here is a peek at how Geeta does this. One day a scholar came to the court of Emperor Akbar and challenged Birbal to answer his questions and prove that he was as clever as people said he was. He asked Birbal, “Would you prefer to answer 100 easy questions or just a single difficult one?” Both the Emperor and Birbal had had a difficult day and were impatient to leave. “How do you know?” asked the scholar, a note of triumph in his voice. “We agreed to ask only one question and you have already asked it,” said Birbal, and he and the Emperor walked away leaving the scholar gaping. This is a model of my lesson plan. Story aids: Tell the story wearing a costume or cloak. Fact file: Great Kings had wise advisors, Koutilya in the court of Chandra Gupta Maurya, Tenali Rama of Krishna Deva Raya’s court and Birbal of Akbar’s court. Follow-up activity: Read other Akbar Birbal, Tenali Raman stories.